Richard Wagner has always been the most controversial genius in music. His critics hate him so much they refuse to even just listen to his music, while his fans greatly admire his talent and are able to separate it from his personal life and unpalatable views. I fall in the latter camp. The way I see it, he was, just like everyone else is, the product of his time and, although that doesn’t justify his beliefs and actions, it helps us to understand them. While there are many books that deal with Wagner and the controversies that surround him, Richard Wagner: The Lighter Side by Terry Quinn, as you can infer from the title, barely touches them. Instead, Quinn, a big fan of Wagner, shares the “trivia, the interesting facts, anecdotes, and quotations about the man and his opera” that he has collected over the years. This includes information on Wagner’s family, his difficulties in creating and staging his operas, the modern productions of his works, the conductor and singers that help bring them to life, the festival and theatre he created in Bavaria, interviews with leading Wagner scholars and much more. The book, which is amply illustrated, is also “musically” arranged: it begins with Vorspiel, followed by 5 Acts with Intermission and a Coda (that’s cooler than chapters, isn’t it?). Informative and entertaining, this book is a must for all Wagner and opera fans. 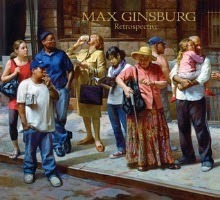 Max Ginsburg is one of the most respected and accomplished realist painters today. He entered the art world at a time when it was strongly opposed to anything realistic, but he never gave up his style. His art provides an insightful commentary on the everyday life of our time, focusing, in particular, on the inhabitants of New York, his hometown. His works, from his portraits to his nudes and to his war paintings, are full of vigour and so skillfully executed you often mistake them for photos. It is impossible to remain unmoved while admiring them. Max Ginsburg Retrospective offers the reader the opportunity to take at look at the artist’s works throughout his career, and to see how his style, but not his beliefs about art and society, has changed. However, to fully enjoy his paintings, I highly recommend you buy the board & paper book. I have the Kindle edition, but the format doesn’t really do them justice. In addition, the book features essays about Ginsburg, his life and his career, written by himself, his colleagues and his students. These allow the reader to better understand the painter’s art and what he is trying to express in his paintings. Highly recommended. Did Richard III usurp the throne? And did he kill the Princes in the Tower? This little guide (it is only 96 pages long) tries to answer these (and only these) questions. This is not a biography of this maligned king, nor an in-depth essay on the two issues it discusses. Instead, after explaining why and how Richard III’s reputation was destroyed, Carson presents the evidence, in relation to the two terrible crimes he’s charged with, both pro and against the King, leaving readers to draw up their own conclusions. The book presents only the bare facts, so you won’t find any new information or theory here. But then this is not a book for Plantagenet experts. It is simply an introduction to the great debate about Richard III aimed at those who are new to the subject and would like to learn more about it in a simple, straightforward, clear-to-understand why. And it will definitely make you want to dig deeper.